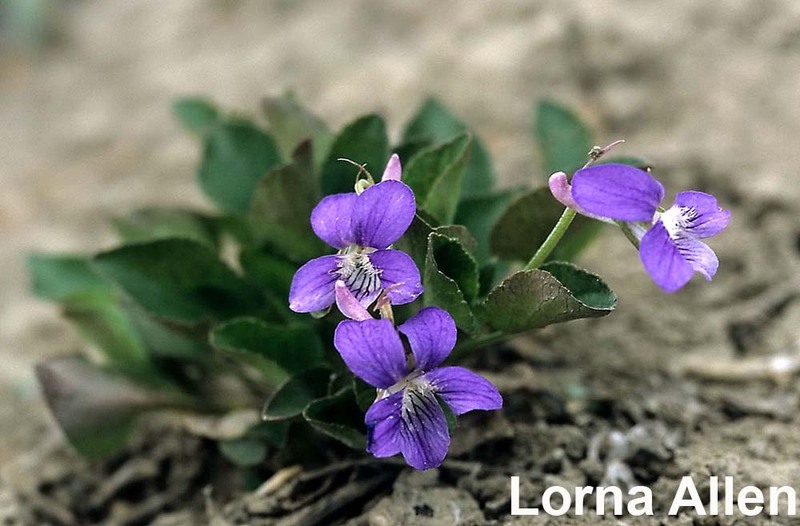 Viola adunca – Early blue violet leaves are very high in Vitamins A and C, with 1/4 cups of these leaves having about the same amount of Vitamin C as 4 oranges. It’s best not to destroy wild plants for food, but these violets grow easily in gardens and even multiply there, thanks to ants. A small wildflower (herb) that grows 4 cm to 10 cm tall. Leaves: Leaves are I cm to 3 cm wide, heart- to kidney-shaped, and are attached along the flower stem. Flowers: Fragrant, bluish-purple flowers are up to 2 cm across. 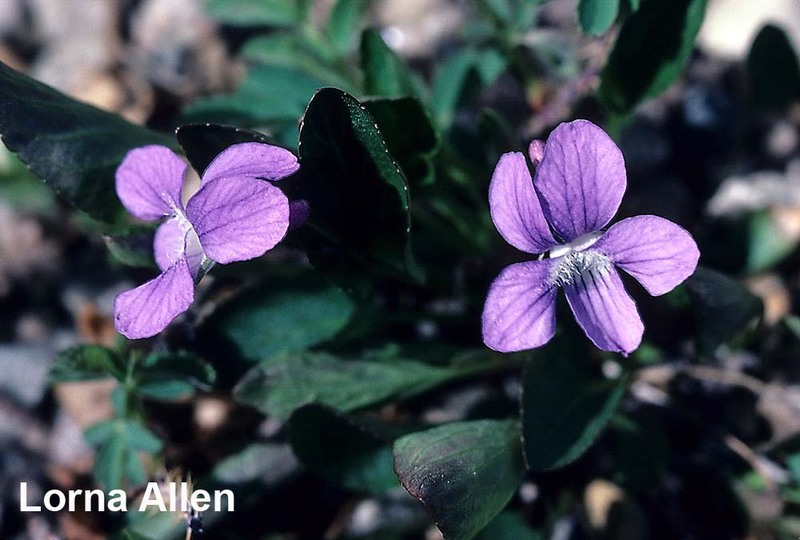 There are purple lines on the three lower petals and white ‘beards’ on the two side petals. Fruit: A dry, 3-valved, many-seeded capsule. 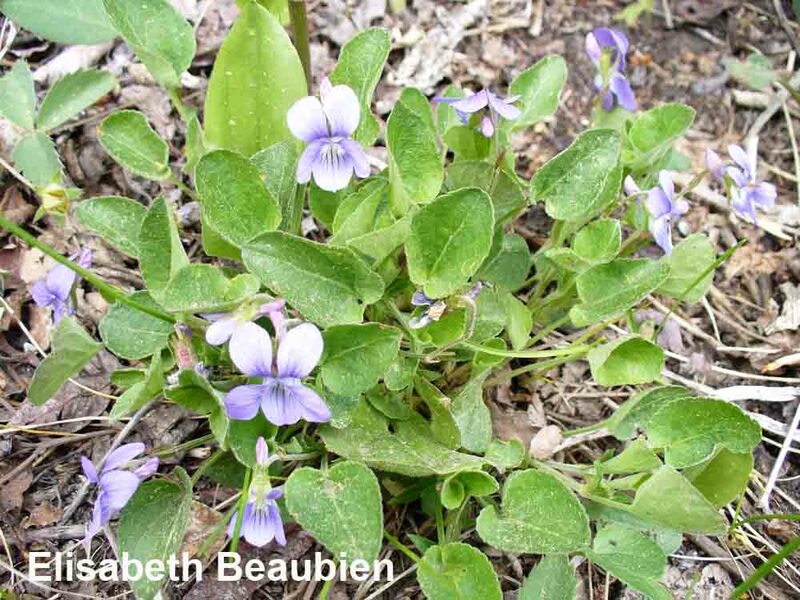 Early blue violet plants grow in open woods and prairie. First bloom: When the first flowers are open in the plant, or patch observed. It usually flowers in mid to late May. Many violets produce 2 types of flowers. In the spring and early summer, their showy blooms (the ones we observe for Plantwatch) appear. However, only a few of these are fertilized each year. If no seed is produced, apomyxis, or self-fertilization occurs. The plant produces much smaller (“blind”) flowers in the fall. These blooms are seldom seen as they are hidden away among the leaves, at or below ground level. Their petals are reduced to tiny scales and their flower parts are reduced in size and number. They have no scent and they never open. These flowers fertilize themselves and produce an abundance of seed, which are normal in appearance, but tend to develop more quickly than seeds produced by cross-pollination. When violet seed capsules mature, the seeds are explosively shot out to several centimeters away from the parent plant. Violet seeds have special oily bodies called elaiosomes (think of them as potato chips!) . These delicious snacks attract ants, which carry them to their nests, thus dispersing the seeds further. Once the ‘snack’ is removed from the seed, the seed is ready to germinate in the loose, open soil around the anthill. Flowers called “cleistogamics” or blind flowers were first discovered on violets. 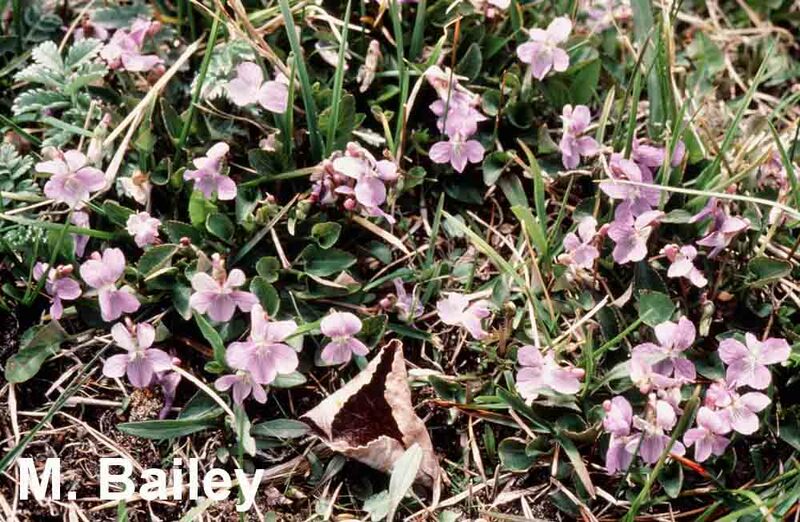 The showy violet flowers that do not open share genes by cross-pollination and produce hardier plants. Flowers usually appear in mid to late May in Alberta. Other than seeds and rhizomes, the entire early blue violet plant is edible. Leaves can be used in salads and to make tea, and candied violet flowers can be used as garnish for desserts. Violet vinegar can be made by adding blossoms to white wine vinegar. The leaves are very high in Vitamins A and C, with 1 ¼ cups of early blue violet leaves having about the same amount of Vitamin C as 4 oranges. In parts of the United States, violets are called wild okra and are often used to thicken soups. Warning: some violet leaves (other species?) contain saponin, which can upset the digestion if large amounts are used. Avoid roots, fruits and seeds, which contain toxins. Medicinally, early blue violet was used as a poultice for bruises, and a violet syrup was made to relieve epilepsy, inflamed eyes, insomnia, jaundice, an sore throats. In modern times, violets have been used to colour and flavour medicines. 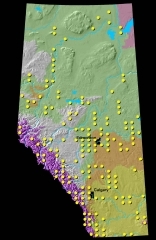 Blackfoot Indians used the blue colour to dye arrows. Violets often appear in ancient artwork and poetry. Mohammed loved the violet, as did Napoleon and the violet became the emblem of the Bonapartists. This plant grows easily in the garden from seed. In forest glade or corpsewood dingle.